OK, never one to shirk a challenge. On my post on modifying the Laser Competition, Peewiglet mentioned that she was dissatisfied with the way the outer tent door is secured when open. I think I’ve come up with an elegant solution. By using an Alpkit micro clip, I’ve secured a length of elastic shock cord from the loop at the bottom of the door to the peg at the back of the tent (see below). The door is now secure, with minimal potential for coming loose or flapping. The reason for using a clipper is that it makes it easy to remove the shock cord if you don’t want it to dangle from the door. However, this is even more cunning as it gives an extra venting option in calm weather. The shock cord can be doubled up and secured around the lateral guy peg to provide a sheltered but ventilated porch space (see below). I’ve also tried it with a short length of dyneema and a line-lok. Although it makes it more secure, it’s a bit fiddly to adjust, so I’m sticking with the shock cord. Et voila mademoiselle la porcelette petite , votre desire est ma commande. On my previous post, Walter suggested making the end guys into a “V”. This is a very good idea and adds to the stability (see below). This adds a lot of flexibility, since if you don’t want to use the extra pegs, you can always double the guys onto one peg. If you use my end to end guying system, again you can use one peg for two guys. I’ve also swapped the pole hood line-loks to the opposite side to the door to make it neater. In response to “dunrigg” who suggested not tieing the pole hood cover to the loops on the flysheet, I checked the tension on the loops. Using the pole hood cover appears not to put much tension on the loops if the pole hood cover is tensioned by the line-loks. It appears that the tension is taken mainly by the cord on either side of the pole hood. So my original configuration of not using the pole hood, but securing the guys to the loops on the fly sheet could have ended in disaster! Using the line-lok system, there is now no excuse for not using the pole hood. Nice ideas, I was thinking about the V end guy the other day. I can’t remember if I’ve mentioned it here before, my mate came up with this way of holding the door up on his Laserlite, works ok on the comp, but the door doesn’t open quite as high. I must tell my Mrs I bought an LC so I can play with it in the garden , so much for dishonesty!! You know, all this work you do with the Lasercomp makes me feel distinctly lazy. The closest I’ve got to working with it is taking a couple extra pegs out with me! Thanks, Shuttleworth, I was wondering whether you could use a walking pole to prop the door open. Now that, I’ve made all these modifications, I feel more confident about the Comp relative to the Akto. I’m getting the hang of pitching it now as well! Wow. I’m humbled and honoured that you liked my V-shape suggestion! I got the idea from someone else, actually. I can’t remember where I saw it, but someone did a mod on a Laser, I think, that ended up having the same guy arrangement as an Akto. The picture must have been up on the OM forum somewhere and I thought one could do something similar on the LC even without the additional loop attachment points. On the question of the pole hood line-loks tensioners: you’re right, it look neater if they’re on the side opposite the door. But I was also thinking that if the wind picks up during the night and you need to re-adjust the pole tension, then it’s better if the line-loks are right outside your door, innit? I love the ventilated porch idea. Must try that out asap! Neatness vs. practicality. Practicality should win really. I might swap them back! The V guys definitely make it more stable. I can’t see any downside other than a couple of grams weight. Good one. Hope TN have you on a royalty if they pick up these tips. Pity they couldn’t have added them in the 1st place, or perhaps you’ve just scooped their revised model ideas for the next 3 or 4 years? A la mode, a la mode, as Del Boy would say. Simon, the two other things I can think of are: pockets for the inner and some kind of protection for the mesh end of the inner if it gets too windy. Why not just buy and use a well designed tent in the first place. Oh, sorry, you do. I’m in the same position, Robin. 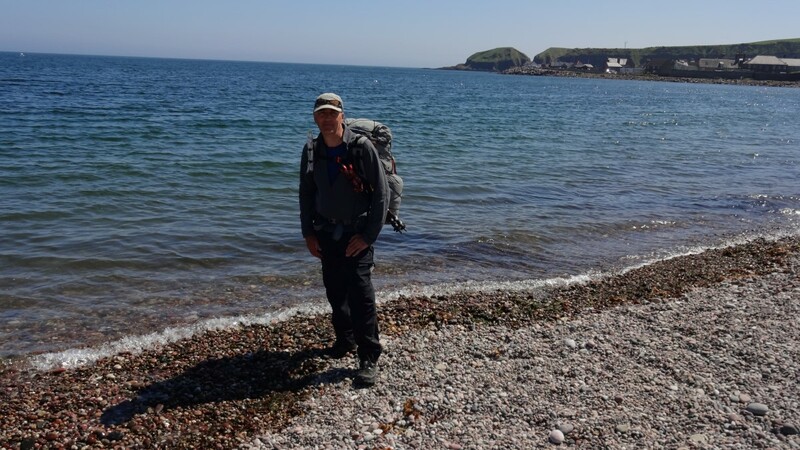 But I find that I can easily fit the LC plus all the stuff I need for an overnighter in an Osprey Talon 33, with a base weight well under 5Kg. Even more than the weight difference, what’s great about the LC is that it compresses so well in the pack. But yes, design-wise, the Akto still rules. I feel like a lone voice in the wilderness speaking up for my ‘Wanda’. She’s far larger than the Akto as well. So for me it’s a no-brainer! Alan, now there’s a thought! 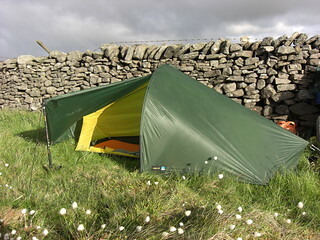 I have a Henry Shires Tarptent which they say can be a bit vunerable in high winds ,not suffered that yet only snow and thunder storm.A tip is to put as extras two tags and guylines halfway down the entrance ridges for more stability.With your set up I can make smaller tags and fix lines easily when needed. Nice one. Sorry ,reread the recommended guyline addition –the extra guys are half way down the lengthwise seams on the Shires tarptent. Have you thought about 1mm Dyneema for the pole hood runners. I don’t really think these take much strain and might save another few grams. It looks a bit awkward to do for not much gain. Hmmm – might be easy. Just tie a really small knot between the pole hood cord and the new Dyneema and pull. Wouldn’t that do it? Maybe it’s me. I thought Robert was suggesting replacing the pole hood cords (the black cord running around the edge of it) with Dyneema. Mine is packed away at the moment but from memory and pictures all it would take is to tie the new Dyneema on to then end of one runner. Then grab the other end of the runner and pull it back through the pole hood. Removing the old runner and pulling the new Dyneema into its place. That’s what I did. You only need one mini cord lock to hold the dual lines at the door end. Remember these lines are only to hold the hood in place. The pole hood guy lines are to take any strain. I’ve just added the little pull loops on the carbon-stay adjuster strap whatsits. I can see them being handy – thanks for that.